Subterra® delivers outstanding, long-term, below-ground insulation performance because it has a much lower rate of long-term water absorption than XPS insulation products. Subterra® is unbelievably rugged and virtually eliminates the expense and delays that are typically associated with the breakage and waste rates of other below-ground insulation products. Subterra® helps to drain water away from the foundation and provides a vapor barrier when it’s used as a perimeter layer of insulation. Graphite Polystyrene is created by infusing high-purity graphite particles into polystyrene beads, thereby creating a dark gray foam board insulation that offers significantly improved energy efficiency. The high-purity graphite particles in GPS provide a reflective property that causes the heat to be reflected hundreds of times as it moves through the insulation. This significantly slows the transfer of heat, giving GPS an energy efficiency of R-5 per nominal inch, which is a boost of up to 20% versus regular expanded polystyrene foam! Additionally, clean steam is also used to make GPS as opposed to the manufacturing process for extruded polystyrene (XPS) foam insulation board products, which uses blowing agents that deplete over time and reduce its insulation value. GPS is also more permeable than XPS and will allow absorbed moisture to escape more quickly. All of these factors enable the GPS core in Halo® Subterra® to maintain its original R-value over time compared to the R-value of regular XPS insulation, which significantly degrades. Subterra is available with a thick polypropylene laminate or with an extra-tough cross-woven laminate (Subterra Plus). 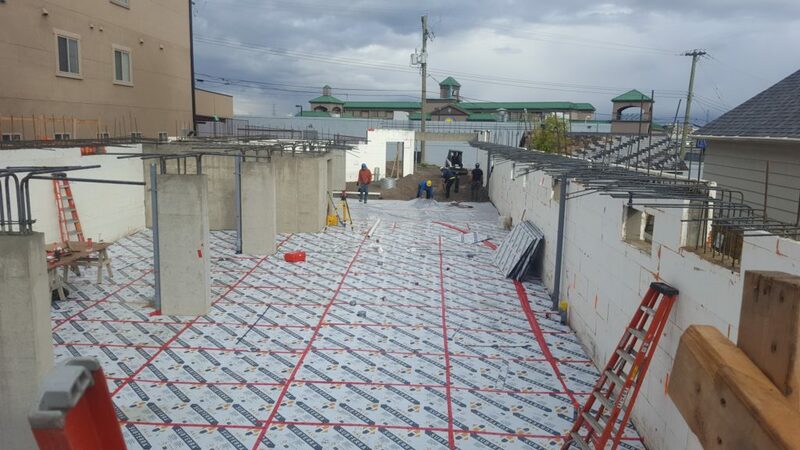 For commercial below-ground applications, XPS insulation products with higher PSI levels are typically specified, but despite the premium price point, breakage and waste rates of 5% – 15% are still often budgeted for. However, with its two outer layers of rugged cross-woven lamination, uber-rugged Subterra® Plus changes the game entirely. 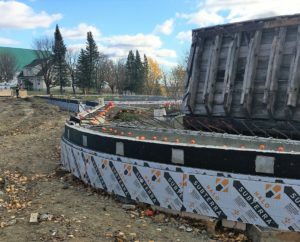 PolyIso was originally specified for this radius wall application, but the general contractor instead chose flexible Halo® Subterra® to save time and money on the install by avoiding the incredible amount of field cuts that PolyIso would have required. Even at lower PSI levels, Subterra® Plus has been laboratory-tested to provide 16% to 30% more flexural strength than higher PSI XPS. The result — virtually zero breakage at a comparable materials price point. As an added bonus, Subterra®’s laminate layers make Subterra® extremely flexible and a perfect choice for radius wall applications. Halo® Subterra® is perfectly designed for below-ground foam board insulation applications and does it all at a very attractive price point. It’s available in R-5, R-7.5, R-10 and even higher R-values. Halo® Subterra® is part of the Halo® Advanced Graphite Insulation System. 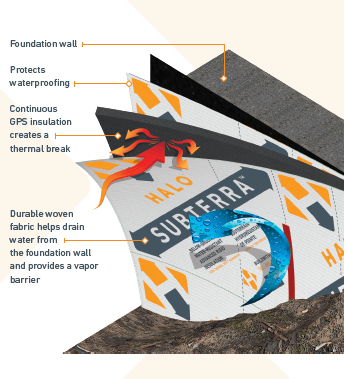 Learn more about Halo® Subterra® and the entire Halo® Advanced Graphite Insulation System — visit BuildWithHalo.com.